Sydney attraction-guides.com - Sydney, Australia attractions guide Sydney Opera House attraction information, history and construction, architecture, guided tours, entertainment, concerts, operas, rehearsals, Harbour Bridge, concert hall, cinema, bars, restaurants, opening hours, location and address of Sydney Opera House, Kenneling Point, Circular Quay, tel / telephone number, and general tourist information about Opera House in Sydney Area, New South Wales NSW, Australia, AU - Last updated 30/10/2012. 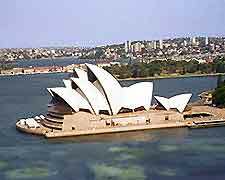 Famous throughout the world, the Sydney Opera House was formally opened in 1973 by Queen Elizabeth II. This vibrant Sydney landmark, with its distinctive sail-like features, was designed by Danish architect Jeer Utzon as a result of an international competition. The Sydney judges chose Arson's design above all others because it was by far the most unusual and inspirational project, but throughout the construction of this building numerous problems were encountered. Because of the constant pressure of arguments and construction delays, Utzon eventually resigned. These immense difficulties culminated in the Sydney Opera House taking ten years longer to build than was first estimated and this escalated the final cost of this magnificent building, with most of the extra money being raised from Sydney lotteries. Partly inspired by the sails of the yachts on Sydney's scenic harbor, the Sydney Opera House is now the most recognised symbol of Sydney and Australia, and is one of the most beautiful buildings in the world. The Sydney Opera House is a gigantic complex and comprises of five different performing venues which include the Opera Theatre, a concert hall, cinema, bars and restaurants. The building offers a wide variety of entertainment and activities in Sydney, including films, opera, drama, music and dancing. 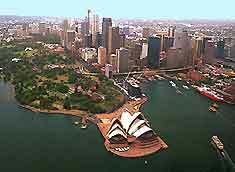 Situated on Bennelong Point on the south side of the harbour, Sydney Opera House is conveniently situated with Circle Quay and Harbour Bridge on one side and the Royal Botanic Gardens and Lady MacQuaries Chair on the other. Throughout night the Opera House is floodlit, providing breathtaking views against Sydney's magnificent harbour. 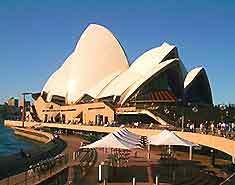 The Impressive Sydney Opera House is open to the public and one-hour guided tours take place every half-hour. There are front house tours daily and back stage tours are available occasionally. Please note that tours of the Sydney Opera House may be postponed at short notice if performances or rehearsals are taking place.